If you have a porch in your housing area, you would not want your car expose under the sun for long hours. Sometimes, you hardly get down the car if it is raining. When you wanted to rest outside your house, you afraid that the heat directly approach to you and hurt you skin. One of the good solutions is install awnings. An awning does not only functional as shade, but also serves as decoration of outdoor. To choose a suitable awning, we need to consider the factors below before purchasing. We would think of parking lots, decks, and patios at the first place when came to planning install awnings. Awnings are also a perfect match with doors and windows. Installing awning for door s and windows can protect the elements from damaging by sun. Awnings can also provide shade and lower the temperature under the deck or patio. It can also protect your outdoor furniture from weather. Your room can also protect by awning to avoid the sun ray comes in directly. Awning is no longer a rare thing and getting more functional in this modern world. We can easily saw awning around even at the entrance of shopping mall parking bay. It is important to know the function of the awning, such as how extendable can it be. A retractable awning allows you to extend it when you need it to shade wider place, and retract them when you don’t. Some awnings are motorized. You can control the length of the shade by only pressing one button either inside or outside your home. There are many types of materials used to create awning, such as metal, polycarbonate, steel, glass, and canvas. For different occasion, different awning material is used for different purpose. For porch at home, the most common type of awning is polycarbonate. Polycarbonate allows the sunlight comes in without feeling the hits. You can now enter your house from porch without getting wet from rain. 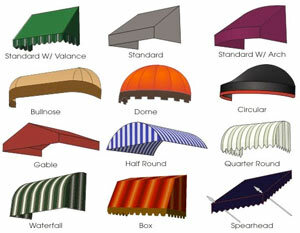 Most of the awning suppliers provide different colour for you to select to match your house renovation and colour theme. If the main purpose of installing awning is to reduce heat, it is recommend choosing light colour awning. For different location, awning serves with different function. You need to understand the functional issue such drainage, ventilation, weight requirements, and more. There are few types of awning style you can choose from: traditional straight-edges awnings with either open or closed sides, dome-style, waterfall, and semi-circular. Pooled water can be the place to grow bacteria and the weight can damage the awning. This is important because Malaysia is a tropical country and often rain. If you are not sure how to choose a right awning system for your home, look for a professional awning supplier for consultation. Do compare the cost, quality, and service provide by different supplier before making decision. Remember to make measurement of the area you want to avoid installed unsuitable awnings. Posted in awning on July 24, 2014 by Simple Internet.